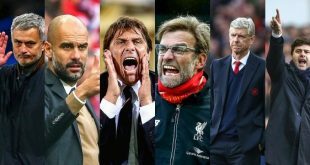 Both Premier League clubs involved in Tuesday’s Champions League action were victorious, as Manchester City and Arsenal found the win column. After being shutout two weeks ago in a 4-0 loss, Manchester City returned the favor to Barcelona with a 3-1 win at home. The English side are now sitting in second place in the Group C table after today’s results. The away side grabbed an early lead and it appeared it may be another up hill battle for Manchester City, as Lionel Messi scored the opener in the 21st minute with a nice finish into the left corner of the net. However, a defensive error in the 39th minute would allow the home side to equalize, Raheem Sterling sent in a cross and Ilkay Gundogan finished the opportunity. In the second half, Manchester City would be the only ones to find the back of the net. Kevin De Bruyne converted a free kick in the 51st minute to put his side in front and Gundogan scored his second of the match to double the advantage. Up next, Manchester City will face Borussia Mönchengladbach three weeks from now on matchday five, the last meeting between the two sides ended in a 4-0 win for Manchester City. Arsenal’s trip to Bulgaria proved to be a more difficult challenge than expected. 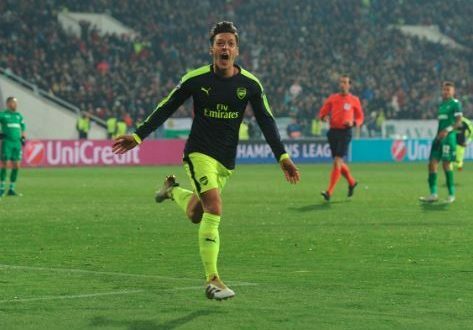 In the end, the North London side came out on top, as Mesut Ozil’s 88th minute goal broke Ludogorets hearts. The victory also sees them through to the Round of 16 with Paris Saint-Germain. The home side came out and shocked the visitors in the opening 15 minutes of the match with two quick goals. Jonathan Cafu was involved with both tallies as he directed a free kick into the net in the 12th minute, and then provided the final ball to Claudiu Kerseru in the 15th minute, to make it 2-0. Despite the good start for Ludogorets, the lead wouldn’t last very long. Granit Xhaka and Olivier Giroud both netted goals before halftime to send the match into a stalemate to start the second half. It would be a nervy second half for both sides as they pursued the go-ahead goal. In the 88th minute, a ball over the top would send Ozil in behind the defense and the German finished it calmly into the back of the net. Up next, Arsenal will face PSG in what will most likely decide the top spot in the group. It ended in a 1-1 draw the last time the two sides met.